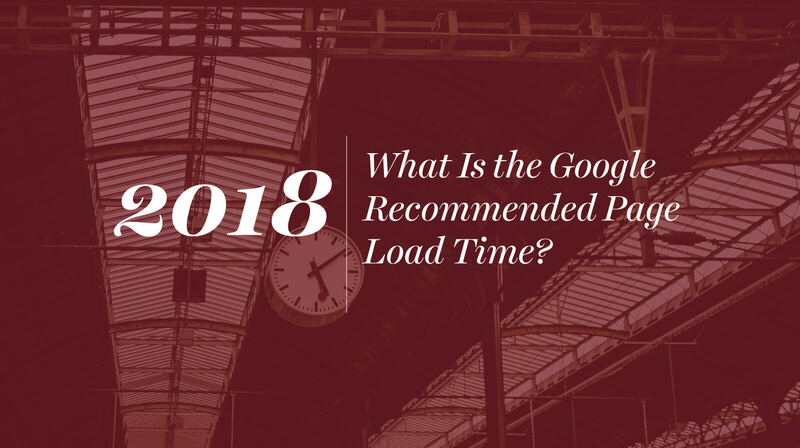 What Is the Google Recommended Page Load Time in 2018? How far can you compromise your load time for an intricate site design? It’s 2018, and I’m still seeing progress bars on websites. Now, I’m not usually a fan of using the year as evidence that there’s something wrong with the world, but this is one of those exceptions: mobile Internet use surpassed desktop in 2014. That same year, Pew research reported that 73% of US adults had a broadband Internet connection in their home. Those numbers have only gone up since, but there seems to be a disconnect among some designers. They see the rise in home broadband as a signal that they can create more bloated, content-heavy pages. After all, if users were willing to wait for pages to load in 2000, why not expect them to hold on for a few extra seconds in 2018? But then there’s mobile. Unlike broadband, mobile-friendly sites need lean web designs, because they rely on mobile networks for data. And even when the speeds are fast, no one wants their data eaten up by a poorly-optimized site. Besides which, users have never had much patience for load times, which is part of what sparked the push to broadband to begin with. So in order to retain your web traffic, your page load time should be as quick as possible. And yes, Google is watching. When it comes to your Google recommended page load time, the answer is unambiguous. The average time it takes to fully load a mobile landing page is 22 seconds, according to a new analysis. Yet 53% of mobile site visitors leave a page that takes longer than three seconds to load. That means your page needs to load in under three seconds, or you lose over half your traffic. And that’s just the ones who will wait around that long: some of your visitors will bounce in even less time. This has a direct affect on your SEO. If Google sees a high bounce rate on your site combined with large file sizes and a poor load time, it will have push your page further down in the page rankings. And that’s not on your users and their short attention spans—that’s on you. Bear in mind, mobile users are interacting with your site while they’re on the move—walking down the street, talking with friends, waiting for the bus, etc. They could be interrupted at any time, and there are lots of external demands on their attention. Contrary to popular opinion, no one wants to be glued to their phone—at least, not if all they’re staring at is a load screen. The literal second your site fails to load, they will be looking elsewhere. But doesn’t page load time rely on their internet connection? How am I responsible? There is some truth to this. If your user has a poor Internet connection, there’s only so much you can do to make your page load faster, and if your site needs certain features or functionality to operate, it may be that you can’t cut down on those items to improve site speed. But you should still do the best you can. You can’t anticipate your users’ network connection, and designing a webpage that requires high speed internet is an accessibility problem that alienates some of your core audience. Optimize your site with compressed, web-friendly images. Want to know if your image is web-friendly? Check the file size. They should be measured in KB, not MB. If they are larger, don’t just save them as images with smaller dimensions—you’ll lose a lot of definition but not save a lot of space. Instead, look for a save option that says “save for web,” or select to save the image at a lower resolution. Do you use Flash to animate parts of your website? Do you have a large video banner in the background of your home page? Does your website begin to automatically stream sound or some other kind of content when people land on the page? All of these elements take up space and add to your load speed. Reduce your page load time by simplifying your site design. Use caching and lazy loading. Caching will let your browser store some of the page elements, such as stylesheets and images, so that they don’t have to be reloaded every time you visit the site. Similarly, lazy loading is a technique where your website will load the most essential elements first, so that users can begin reading the page before other, larger elements have loaded. Reduce the number of redirects it takes users to find your site. It’s typical for companies to have redirects for various domains to ensure that a visitor will find them. We use this on our site, where www.buildcreatestudios.com (our old domain) redirects to buildcreate.com (our new domain). So far so good. But sometimes we see websites redirect a visit to a /home, or through a veritable string of redirects that are mostly unnecessary. If you notice this problem on your site, it’s worth looking into and seeing what redirects you can cut out of the chain. No, your users won’t wait for you—and they shouldn’t be expected to. The mindset that users should be willing to wait for your content to load—and that if they don’t it’s because they’re “too impatient”—needs to die. Having a website that meets the google recommended page load time in 2018 is crucial. Without it, both you and your visitors suffer. If your website is slow and you don’t know what to do about it, it may be in need of a redesign. If so, we’re happy to look at your current site and discuss ways to improve its functionality. We recommend downloading our 2018 Guide to Buying a Better Website to learn more about how to bring your website up to speed for the modern era, and if you think we could help you with your Michigan web design, contact us to get started.